The township known as Friberg has the unique honor of having had three names within the first year of its existence. Organized as Florence township on January 6, 1874, it was changed by the county commissioners to Woodland on the 18th of the following March, and finally given its present name on the 1st of the following June. It was organized in response to a petition of twenty-five legal voters, residing in township 134, range 42. The commissioners' records fail to state when and where the first election was held, but the names of the petitioners follow: Ferdinand Peters, W. Schmidt, Frederef Grusentroy, Ferdinand Schmidt, John H. Laplin, , Adolph Virause, Wilhelm Danow, Frederick. Eichstadt, Charts. Mery, Will Holder, Ralph Roxbar, August Leutwig, Conrad Munz, Sofia Peters, M. Vollmers, , Wilhelm	Ludivigg, J. S. Wensthrom, John	Seeba, John Frigberg, Peder Olsen,	, Christian Kappler, F. B. Price, John Johnson and Martin Johnson. Several of the names in this list were written in German script and very illegible. It is interesting to note that the southern tier of sections in that part of the township lying south of the Otter Tail river was attached to Aurdal township January 3, 1872. The commissioners had authorized this change in response to a petition of Andrew Johnson, which is given here verbatim: "The undersigned asks that all the sections on the south side of the Otter Tail river, in township 134, range 42, be attached to the township of Aurdal for the reason this part of the first named is not settled yet except by the undersigned and the greatest portion of the township will not probably be much settled in the first ten years. Now, to make it a little convenient for me, I pray you will attach the above described territory to the organized township of Aurdal. Your obedient servant, Andrew Johnson." The most striking feature of the topography of Friberg township is its large number of lakes, no less than sixty being scattered over its surface. The largest lakes are Heilberg, Tonseth, Long, Big Stone, Sproul, Wolf, Rice and Evans. 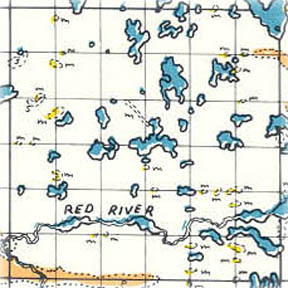 Red river runs through the township from east to west through sections 25, 26, 27, 28, 29, 30 and 31, leaving the township in the center of the southern part of the latter section. One of the first, if not the first, sawmill in the township was located on Red river in the western part of, section 26. Probably the first church was built by the German Lutherans in the extreme southwestern corner of the township. There was also a cemetery at this place. Two other burial grounds which date from the early history of the township are to be found in sections 4 and 34, respectively. The first postoffice was a Friberg, which stood in section 34 near the southern boundary of the township. At different times in the past, postoffices have been maintained at Weggeland, in section 35, and at Rumsey, in section 16, a general store being located at both places. The present township officers are as follows: Supervisors, H. L. Munger, William Buchholz and Carl Shol; clerk, H. F. Duenow; treasurer, H. R. Wenstrow; assessor, F. W. Drews; justices, H. Wilshusen and E. W. Leeper; constables, E. W. Olds and Fred Buchholz. Places of birth for Friberg Township in the 1905 state census.